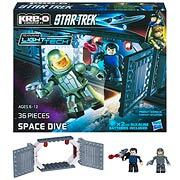 Bad Robot and Hasbro have released a funny stop-motion short made with the Star Trek KRE-O building block sets. You can watch that below. 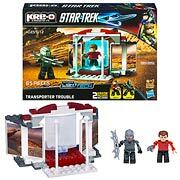 Also the new Hasbro Star Trek KRE-Os have just arrived arrived in stores (links below). 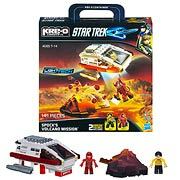 Here is the Bad Robot stop-motion "Star Trek Into Blockness" video made with KRE-O figures. 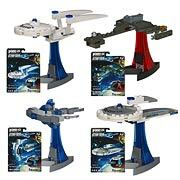 The Star Trek KRE-O sets (for both Into Darkness and general Star Trek) are now available. You can order them below from Entertainment Earth. TrekMovie will be taking a closer look at the new releases soon. I have to admit I laughed, I could almost see Sterling Archer say that line. Actually, that was pretty good. Some poking fun at Trek “Red alert! Shields up! Lens flare!”, and some poking fun at the fact that they’re blocks. The best part was when Kirk removed his helmet and had to put his hair back on. If I had kids, I’d definitely buy these. I wouldn’t mind seeing a lot more of that. That was very well done. I’m not sure if it’s the same in the movie, but that so called “bird of prey” looks more like a small fighter craft. A “Bird of Prey” is a much larger scout class vessel, housing anywhere from 12-30 crew. I hope team JJ haven’t messed this up! Is Hasbro planning to launch any decent toys for this movie? Dammit, Scotty, why didn’t you press the purple sticker. THere’s not gonna be any regular action figures? Freakin Awesome! 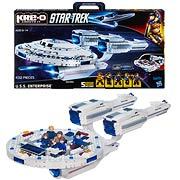 I wish the Kre-O Enterprise was based off of that design. I would actually pick it up. Any way I’ll be subscribing to your augment or even I fulfillment you get entry to constantly fast. @9 — I’m sure hoping there will be because I’m definitely not interested in any of this although the stop-action short was fun. This alternate, alternate universe transmission from Talos 4, is better than the movie. Makes more sense too. :^) Kidding. I thought that short would be cheesy but I gotta admit, it was pretty awesome! Still doesn’t make me want to buy the toy but it was awesome. This short should be shown in the cinemas before STID. Love the hair gag and the one-liners. When was the last time you walked into a store of virtually any kind that had a toy section, even a small section, that didn’t have Star Wars toys? Convenience stores, department stores, electronic stores, CVS, Walgreens, not to mention Toys R Us, etc. The youth market is where TPTB have continued to drop the ball. Trek needs to be market so much better than it has been and it needs to be relatable to kids so that there is a next gen Trekker. Toys, collectables, action figures, better video games, animated tv shows and movies, etc. Why are they ignoring this huge $egment of the market?? Why do I suddenly want to but these lol! “Red alert, shields up, LENS FLARE!” LMFAO!!!! Yes, it was very amusing — but I’d like to note that the animation techniques and brick-life conceits (e.g., swapping hair) have been established in amateur films by LEGO fans over the past decade (see, e.g., brickfilms.com and bricksinmotion.com) and, to a lesser extent (by volume of output) in official shorts by the LEGO Company. 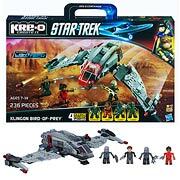 Speaking as someone who compares modular building systems, Hasbro’s KRE-O bricks are LEGO System-compatible and, in many cases, direct copies of recent specialized elements. 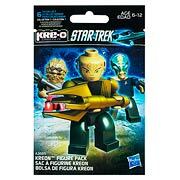 The “Kreon” figure is more agile than the 1978 LEGO Minifigure, with ball-joint hips and shoulders, and a swiveling waist; with features (arm constrictions and ankle-holes) designed to accept accessories for the original Transformers-themed sets. The heads are compatible between the two styles, but do *not* put Kreon Megatron’s helmet on a LEGO head — it’ll stick. Tolerances on interlocking building bricks are *extremely* tight.